This wonderful series of illustration personifies Chinese drugs in human form in classical Chinese illustrations. The idea was to represent their nature including taste and effects in illustrations depicting human forms. 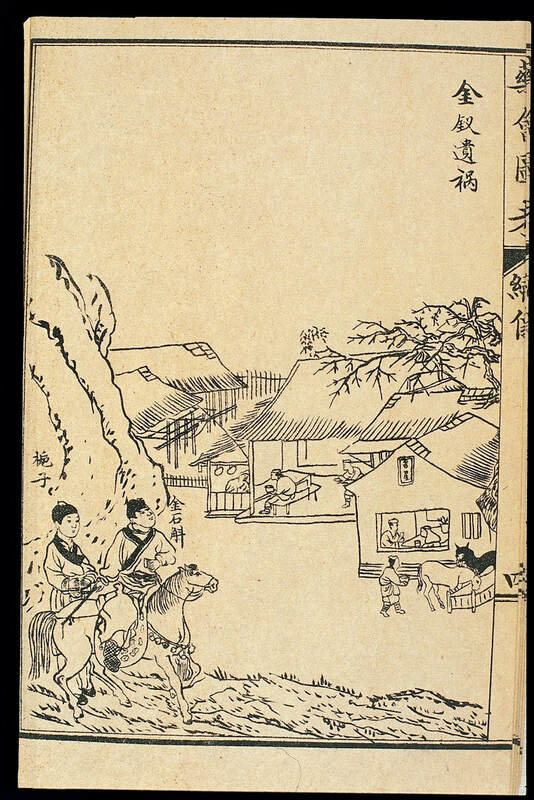 Yaohui tukao (Illustrated Congregation of Drugs), published in 1935 (24th year of the Republic of China), presents the materia medica in dramatic form. It consists of ten scenes, in which various drugs appear as protagonists. The following illustrations, along with their descriptions are from the Wellcome Collection. To see 1000's of other images related to History of Medicine, visit the homepage of wellcomecollection.org. This illustration accompanies Scene 3, Yaoshe chuxian (The Snake Monsters Appear), in which characters personifying Cape jasmine (zhizi), long-nosed pit viper (baihua she), and Chinese rat snake (wushao she, Zaocys dhumnades (Cantor)) present the sapors, potencies, and therapeutic uses of various drugs through the medium of spoken dialogue and song. This illustration accompanies Scene 4, 'Dendrobium Overcomes the Monsters', in which characters personifying dendrobium (jinshi hu), Cape jasmine (zhizi), Chinese rat snake (wushao she, Zaocys dhumnades (Cantor)), and long-nosed pit viper (baihua she) present the sapors, potencies, and therapeutic uses of various drugs through the medium of spoken dialogue and song. 'This illustration accompanies Scene 8, ' The Gold Hairpin Disaster', in which characters personifying personifying Cape jasmine (zhizi), dendrobium (shihu) and chrysanthemum present the sapors, potencies, and therapeutic uses of various drugs through the medium of spoken dialogue and song'. 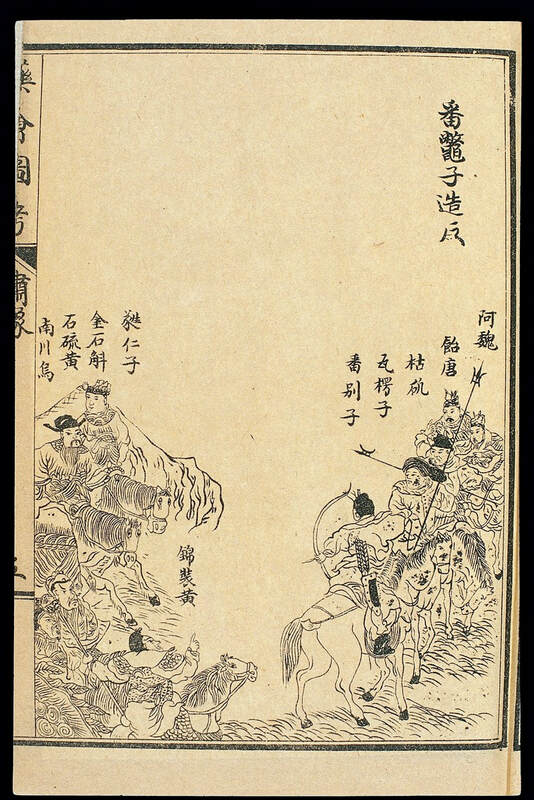 This illustration accompanies Scene 9, Fan biezi zaofan (Nux Vomica Stages a Revolt), in which characters personifying nux vomica (fan biezi, lit 'the foreign turtle'), malt syrup (yitang) and arc shell (walengzi) present the sapors, potencies, and therapeutic uses of various drugs through the medium of spoken dialogue and song. 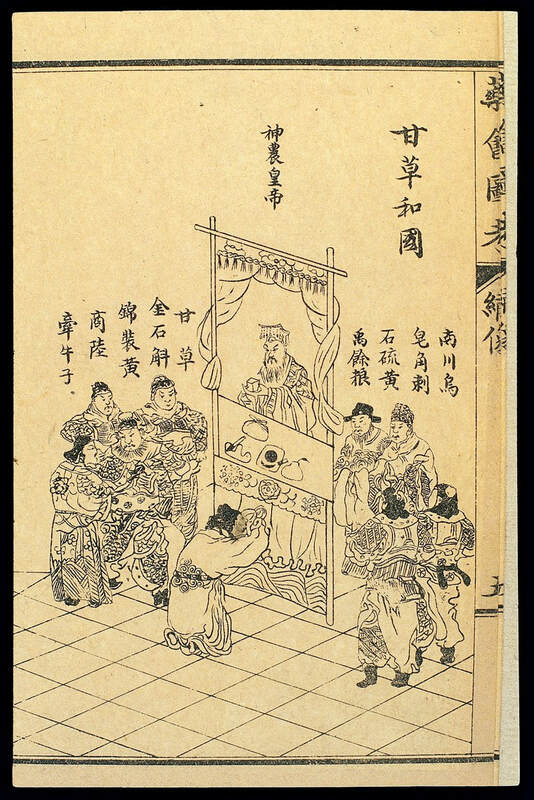 This illustration accompanies Scene 10, Liquorice Brings Harmony to the Land (Gancao he guo), in which characters personifying liquorice, dendrobium (shihu) and rhubarb present the sapors, potencies, and therapeutic uses of various drugs through the medium of spoken dialogue and song.